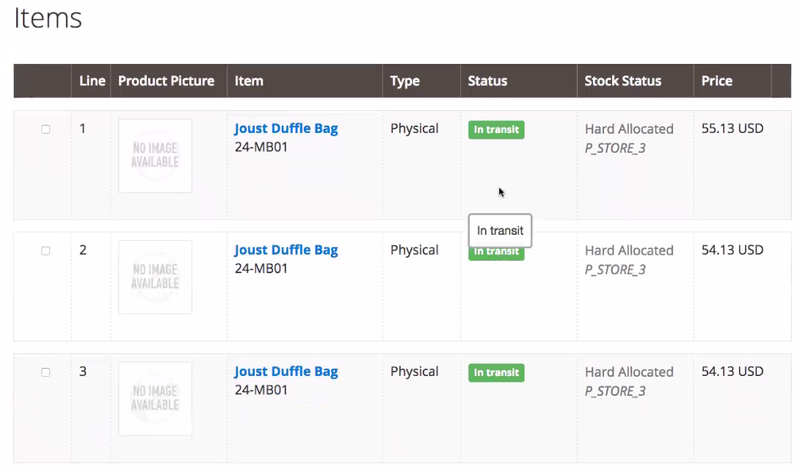 The ship to store (STS) functionality allows you to optimize your inventory across different sources for in-store pickup (ISPU) orders. The ability to move stock from one source to another allows you to manage orders with out-of-stock products and request shipment to the destination source for collection by the customer. A Store Assistant can complete the entire process—from start to finish—so that when a customer comes to collect the products from the store the order can be closed out. A Customer Service Agent can track ship to store orders so that they can give comprehensive support to customers. See Ship to Store Process for more information. 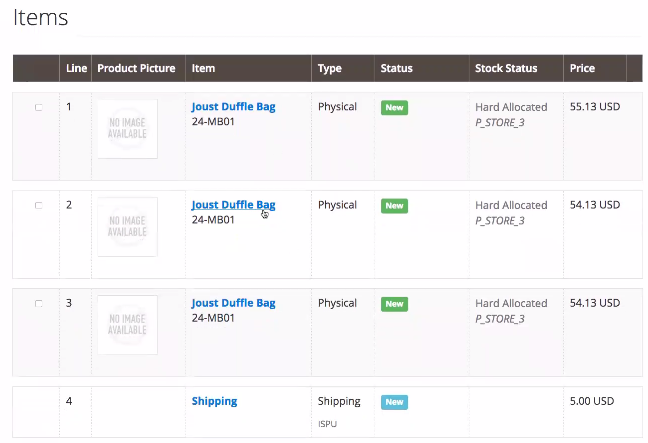 To explain the STS process, including the pick and collection of in-stock and arrival-pending SKUs, we use the example of an order that is in the Logistic in progress (ready to ship) status. The sourcing engine processed the order and created two different shipment requests: an ISPU order and an STS order. 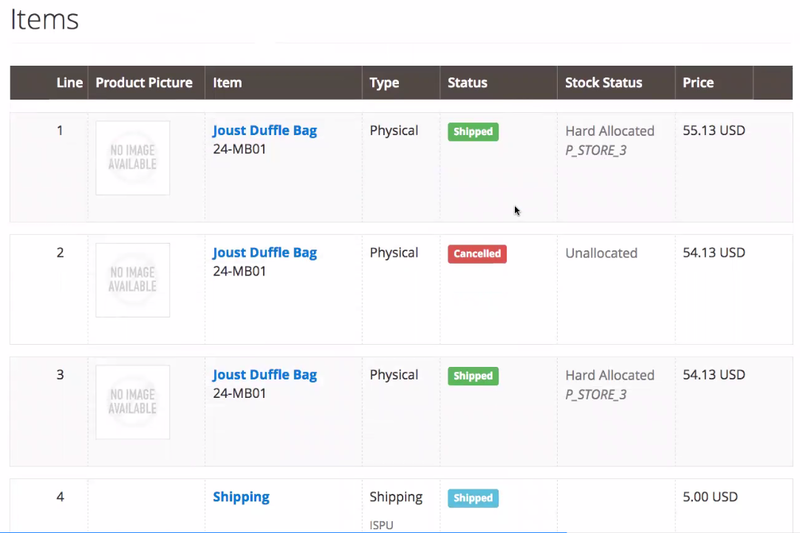 The item status for all order lines is New, as shown. To source an order that has a defined pickup location but no available stock, the sourcing engine will search for the most appropriate source (based on the defined rules) that have the ship to source capability enabled. Sources with this capability enabled are assumed to be shippable to any provided pickup location. Navigate to System > Sources and click your desired source. 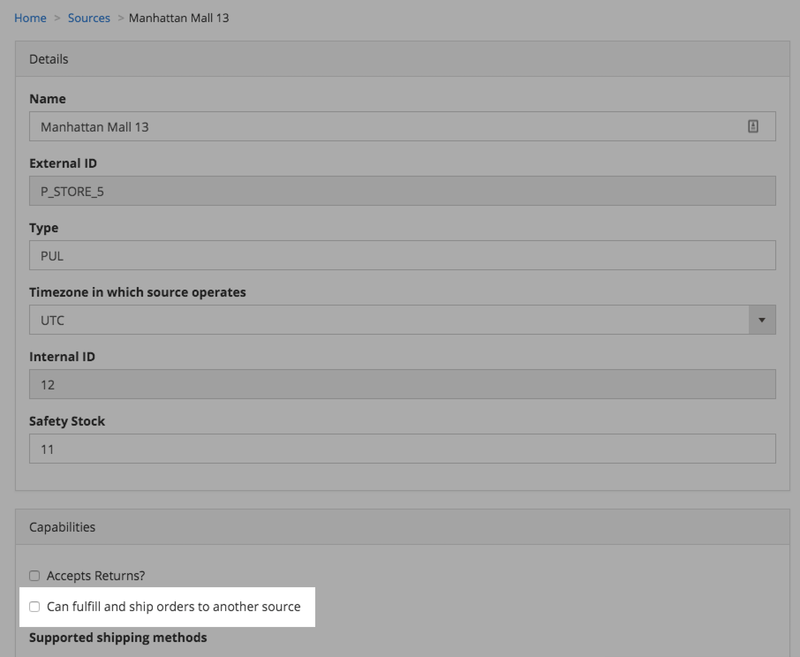 In the Capabilities section, select the Can fulfill and ship orders to another source option. You can also use the magento.inventory.source_management.update message to enable it. Navigate to Sales > Ship from Store. A link to the SFS pick list will be created in the General Information section of the order. You can generate the pick list for the requested products for the available source. There is another link to the ISPU pick list, but the pick status is Pending arrival, so you cannot take any action for this source. Access the SFS pick list via the available link in the General information section and confirm the requested items. Once you confirm the items, the STS shipment request status will update to Pickconfirmed and the shipment request item status will update to Assigned. The ISPU shipment request statuses do not change in this step of the process, and the order lines remain New. In the SFS flow, the order lines would be pick-confirmed, but since this is a STS shipment request and the requested source is not the final one, we consider this step an intermediary process between sources. Click Confirm Shipping to confirm the shipment. The shipment request status and the item status will change to Shipped. The status will remain as New for the ISPU shipment request, but the shipment request item status will be In transit, as it is waiting for the products to arrive. When you access the ISPU pick list, the action buttons are enabled so that you can confirm or decline each of the items when they arrive at the final source. A notification is sent to the collection source with information about the order, including a list of all items, pending and active. Continue on with the standard ISPU process, confirming and declining each of the items. See the User guide page for ISPU for more information about this process. The order status will be updated to Complete (order completed, shipped) if all the items were confirmed, and Complete (order completed, partially shipped) if some of the items were declined. Item statuses will be updated from in transit to shipped if the item was confirmed, and cancelled if it was declined. The shipment request status for both shipment requests will be shipped. The ISPU shipment request item status will be Collected or Declined by customer depending on whether you confirmed or declined items, though the STS status will remain as _shipped__. This entire process will be the same if you have two different STS shipment requests. You can track STS orders so that you can give optimal support to customers. The View order in customer service link, in the General information section, gives you access to the Customer Service page so that you may see relevant information about this specific order. The first notification tells you that there was a shipment request notification that was sent to one source, but the items requested were out of stock so they were requested to a different source in order to fulfill the order. The second notification for the STS source includes the name of the store where the products will be collected. When the STS source sends the items to the ISPU source, the third notification is sent to inform you that the packages have been shipped. You can view the tracking link from the carrier as well. The last notification is sent when the ISPU source fulfills the products. It signifies that the final customer has come to collect his products.